These models designed with the Crossfire technology to fire at any angle, even upside down. 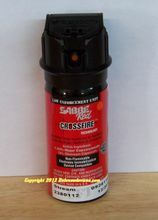 The 52cft10 model has been the most popular Sabre pepper spray we sell. 52CFT10GEL is the MK3, 1.8 oz Flip Top Gel formula. Level 3 formula 2MM SHU, 10%, 20 foot range. CROSSFIRE can deploy continuously from any position or angle to increase target acquisition. SABRE�s Crossfire technology was specifically developed to give officers the upper-hand when controlling dynamic subjects. Superior to 1st and 2nd generation Aerosol Irritant Projectors, Crossfire introduces 3rd generation technology which allows SABRE OC canisters to deploy continuously from any position. Picture the face of an analog clock which displays the time through the use of fixed numbered dials and moving hands. 1st generation OC sprays only deploy upright between the clock�s 10 and 2 dials. 2nd generation OC sprays increase target acquisition with the addition of � second bursts deployments between the clock�s 4 and 8 dials. The 3rd generation Crossfire will deploy continuously from any position or dial on a clock to maximize target acquisition when encountering dynamic subjects. This is the famous Sabre Red 10% of 2 MM SHU formula in a can that can spray upside down and sideways. Flip Top Activator and Stream Spray Pattern. MK3 size, 4.35 inches tall and 1.5 inches wide. Rated for 10 1-second bursts with 12-15 foot Range. Also available is the MK4 version(3.0 oz of formula) for $3 more. Other models also available. See dropdown menu"
MK3 dimensions: 1.375 in D x 4.375 in tall. MK4 dimensions: 1.375 in D x 6.375 in tall. We cannot ship pepper spray to NY, MA, WI, HI, AK, PO boxes or APO addresses. Pepper spray cannot be shipped by air, only ground service can be used. Item arrived on time and as described. The expiration date on the item showed it was of recent manufacture. Very satisfied.